Yesterday I had a very enjoyable day birding with a number of my friends from the Master Birding Program. We went to Elsie Roemer Bird Sanctuary in Alameda and Garretson Pt., which is part of Martin Luther King Regional Shoreline in Oakland. We found over 40 species at each site. Elsie Roemer Bird Sanctuary is a salt marsh that is an excellent place to see shorebirds. The highlight at Elsie Roemer was seeing a group of about 30 Snowy Plovers on the beach. There were a couple of thousand Western Sandpipers flying in large groups and beautifully reflecting the light. 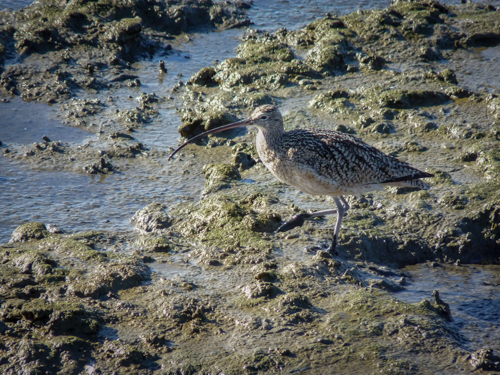 There were more Long-billed Curlew than most of us usually see. Interestingly we saw Snowy Plover, Semi-palmated Plovers and Black-bellied plovers but no Killdeer. A few members saw a Ruddy Turnstone which unfortunately I missed. At Garretson Point we were happy to see that the seasonal pond had water in it and Northern Pintail, Green-winged Teal, Northern Shovelers and American Wigeon. We heard but were unable to see three Ridgway’s Rails. A few group members also saw a Common Yellowthroat. We didn’t find Cinnamon Teal or Blue-winged Teal, which both have been reported here recently on eBird. Much further out on the bay from both locations we could see what were probably 100’s or even 1000’s of waterbirds although all we could make out even with scopes was that many were scaup. Surprisingly scare today were Mallards; only two were seen at Garretson Pt. One other highlight of the day was the Cocoa Banana Bread. Snow/Ross’s Goose 1 Dead. In water. Snowy Plover 30 Hunkered down in the sand on Crown Beach just past the breakwater.